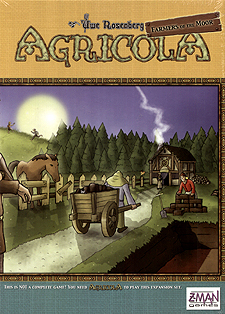 "Agricola: Farmers of the Moor" is an expansion for "Agricola", the winner of the "Deutscher Spielepreis" 2008. Life is not easy for a Farmer on the Moor: each player starts the game with 5 Forest and 3 Moor tiles on their farm. Fortunately, though, there are new Special actions, which allow players to make even these areas usable: "Fell Trees" provides an additional 2 Wood, "Slash and Burn" coverts a Forest tile to a Field, and a player who "Cuts Peat" receives 3 Fuel. 14 additional Major Improvements are added in "Farmers of the Moor". There are new Special actions allowing users to acquire Improvements. Players can also choose to play with the additional Minor Improvements that are included with this expansion. This gives the "Farmers of the Moor" expansion some of the variety in gameplay that has made the basic game so popular.